The houses in which people live all over the world are very different. In Germany, you used to be able to tell from the way a house was built in which region it was situated. Nowadays this is less and less the case. The availability of all possible construction materials has led to a standardization and uniformity of residential architecture. Each house can be found in any place in Germany. As everything is technically feasible, more and more anonymous, more-complicated and bizarre houses have been built. Simple designs have become a rarity. Uniformity and banality on the one hand, and uniqueness and weirdness on the other hand, are of course a big attraction for the photographer. Therefore, these homes have been one my favorite subjects for many years. 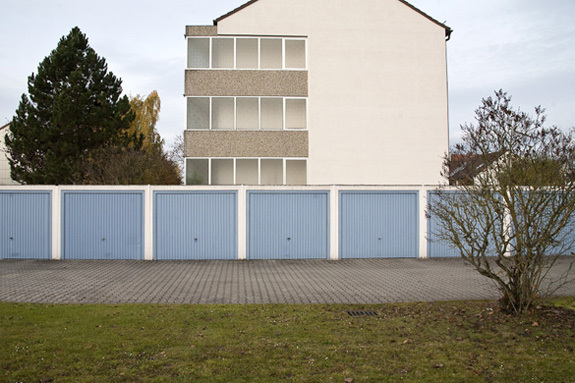 At first glance, the viewer sees an unspectacular multi-family house that is very common for Germany, with a simple aesthetic. Utilitarian architecture without any artistic or creative value. However, if we take the time to have a closer look, a three-dimensional residential building with garages, a paved courtyard and a grass strip becomes a two-dimensional structure. Upon closer examination, the realistic depiction of the house becomes more and more abstract, a picture composed of vertical and horizontal lines, colors and surfaces, of rhythmic subdivisions and geometric structures that make the real individual objects almost disappear. Instead, the forms and colors develop their own aesthetic quality. In fact, the photographic reality increasingly questions reality as we generally see it. The mundane and banal become something special. The three-dimensionality only returns when the viewer’s gaze focuses on the trees in the background on the left or the bush on the right. Only these minor details are actually capable of dissolving the level of abstraction the photography has attained and of again restoring a sense of reality.